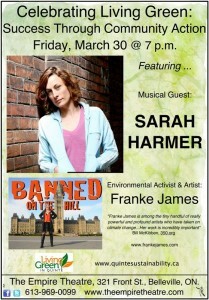 Living Green in Quinte invited Franke James to be the keynote speaker for the “Celebrating Living Green” March 30th event, with activist and platinum-winning musician Sarah Harmer who co-founded PERL to protect the Niagara Escarpment. In January 2007 Franke was just an ordinary citizen concerned about climate change. Then she decided to take action — using words and pictures and making big changes in her own life. Since then, Franke’s visual essays about her personal environmental actions have propelled her into the international spotlight. 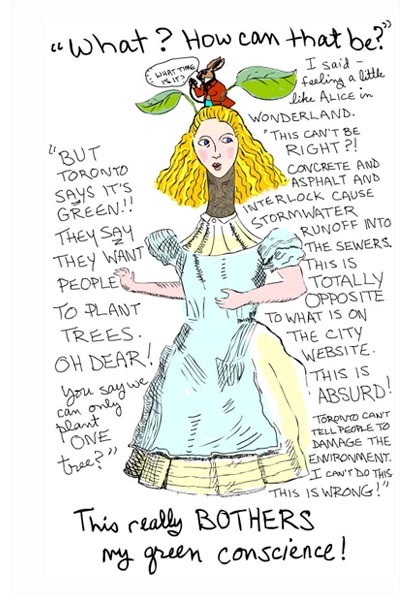 Franke chose to speak up publicly — first about a green driveway in 2007, which the City of Toronto said would be “illegal”. And then in 2008 by writing a letter to the Prime Minister asking for more government regulations to make polluters pay. And in 2009 by debuting her story “Fat Cat Canada’s Giant Litter Box” at the same time as she travelled to the UN climate change talks in Copenhagen. Remarkably in 2011 the full impact of these small bits of activism was revealed when she discovered that the Canadian Government was not a fan of her environmental essays… Franke James is going to share her stories with us on March 30th. 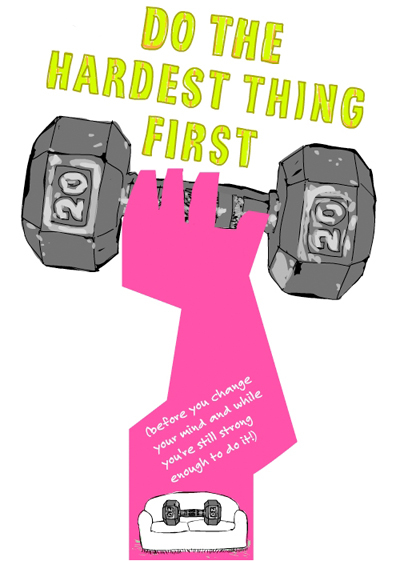 And tell us why her motto of “doing the hardest thing first” can lead to tremendous personal growth and a recognition of our power as individuals to change our world — starting with ourselves and our own back (or front) yards. Living Green in Quinte’s bold purpose is to encourage local citizens to explore sustainable lifestyle options through access to information, resources and local expertise all year long. They are a joint venture of thirteen community groups which include Quinte Conservation, Friends of the Frink Centre, Hastings Stewardship Council, Lower Trent Conservation, Prince Edward Stewardship Council, and the City of Belleville Green Task Force. Artist, author, and speaker Franke James is an entertaining and persuasive advocate for the environment. She merges science, art, political savvy, and storytelling to inspire people to take action and ‘do the hardest thing first’ for the planet. Franke is the author of Bothered By My Green Conscience. She has delivered keynote presentations to audiences across Canada and the U.S.A.